In fact it turns out we scream for it a lot. The average American consumes around 22 pounds of ice cream per year (IDAF). In 2014 alone ice cream companies made 872 million gallons of ice cream (that’s enough to fill nearly 1,500 Olympic sized swimming pools). Despite how many frozen treats we eat as a nation, ask anyone the difference between ice cream, gelato and sorbet and you will probably be met with blank stares. In fact, what is sorbet and why is it always fruit flavored? ; does ice cream have to be made from dairy? what is the difference between gelato and ice cream? ; and what are the alternatives on the market made of? Below we breakdown everything you need to know on frozen treats. Believe it or not, not anything can be called ice cream. The industry is heavily regulated and enforced by the FDA. 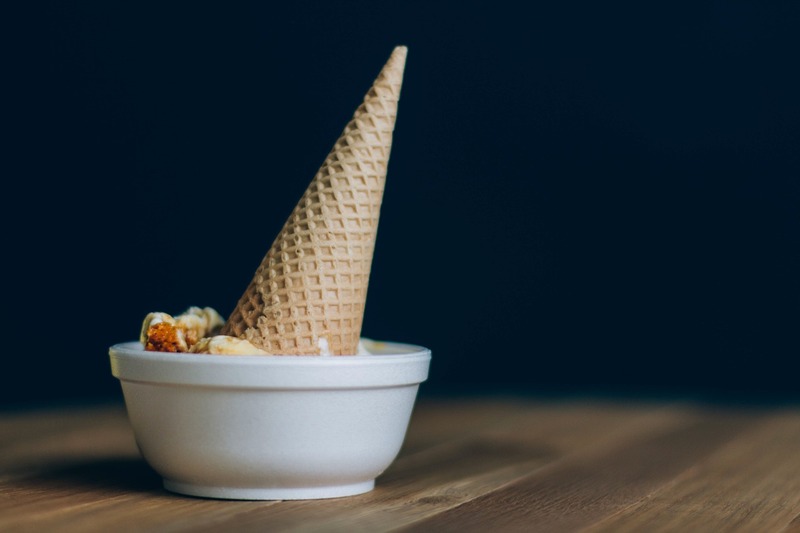 An ice cream is made from a mix of dairy products and must contain at least 10 percent butterfat before it can be even called an “Ice Cream” legally. All ice cream is made the same way using a simple custard base which is then flavored. In culinary terms ice cream is an emulsion of dairy and dairy fats which is then whipped and frozen. The key is fat and air. The more air you can whip in the lighter and smoother the texture. The balance has to be just right. The better the ice cream usually the less air and the more fat it has to make for a thicker more indulgent texture. Gelato is an Italian style ice cream. Made still from an ice cream base it typically is churned and whipped slower and for longer periods when being made. This allows for less air to be added to the mix making it thicker. It is typically also served at slightly higher temperatures than ice cream to give it a creamy and thicker feel when eating. Butterfat levels tend to be lower than ice cream. Still a form of dairy dessert, sherbet should not be confused with sorbet. It is made using milk and/or egg whites to give a lighter texture. Butterfat levels tend to be 1 to 2 percent butterfat making it lighter than ice cream. Frozen yogurt is made without any cream. Instead bacteria cultures are added to an ice cream base to emulsify the dairy solution. It tends to yield a soft mouth feel and the added bacterial cultures is what gives frozen yogurt its pro-biotic element. A trend has been to start using Greek yogurt as the base. Greek yogurt has about double the amount of protein to regular yogurt and is strained more intensely to remove excess liquid whey and lactose making it a thicker and creamier texture. Sorbet is basically a sugar syrup water solution which is then flavored. Simply take a jug of water and add sugar, some more sugar and then a little bit more sugar before cooking to dissolve in the water. The result is a syrup solution which you can flavor. Fruits tend to be used most commonly for flavoring because of sorbets high water content. Sorbets tend to be fat free, but are much higher in sugar content. Also the high water content gives then an icy texture. A more common variety is non-dairy versions of ice cream. Whilst, legally not ice cream these alternatives use a variety of different milks instead of dairy. Most common versions include soy, almond, cashew and coconut milk. Like ice creams, these alternative milk bases are then sweetened and flavored. The downside is that these bases can often been just as high if not higher in fat and not great if you have a nut allergy. If you haven’t already noticed, the one thing all the other frozen treats have in common is a base i.e. a basic formula which is used each time and then flavored. Ice cream, Gelato and Sherbet have a dairy cream base, Sorbet a sugar syrup base and Frozen Yogurt a dairy culture base. At Frozen Fruit Co we don’t believe in bases. Why should everything be the same, after all ingredients and flavors are different for a reason! Instead what we do is take whole fruit and mix then together with natural fruit sugars to create a naturally soft and smooth frozen treat with none of the base. This breaks all of the rules of frozen treat making without compromising on taste or a cleaner and more natural ingredient list. This makes all of our fruit soft serve dairy free, vegan, gluten free, free from preservatives, flavors and colors and sweetened only with natural fruit sugars whilst still giving big flavor and texture. You see, frozen treats don’t need to be unhealthy and filled with dairy and processed ingredients. With fruit soft serve you can “have your cake and eat it”. Breakfast, lunch, dinner or just as a snack…because it is just made from fruit and naturally occurring fruit sugars. What to know more about Frozen Fruit Co then come check us out at 729 Montana Ave, STE 2 Santa Monica, CA 90403 or order online via Postmates, Ubereats, Doordash or Grubhub.